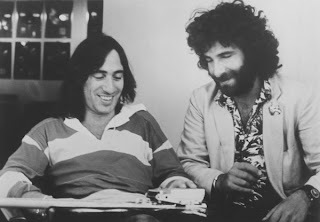 After they left the highly successful art rock band 10CC in the mid seventies, Kevin Godley and Lol Creme (image credit), the two main creative forces behind the band, went on as a duo. Although I always had the feeling they could have been better than they actually were, they did make a number of interesting songs, such as An Englishman in New York, with its weird lyrics. Their absolute masterpiece is the spooky 1981 single Under your thumb, from the album Ismism (also released as Snack Attack), which made the UK top 10. The relentless rhythm perfectly fits the lyrics about a ghostly encounter during a train ride.